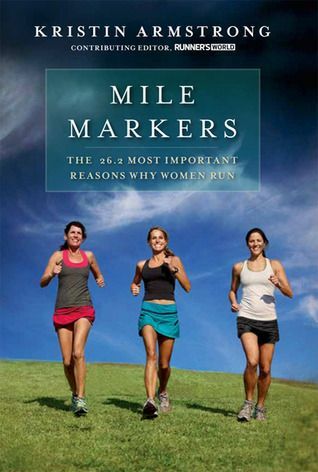 When a friend recommended Mile Markers: The 26.2 Most Important Reasons Why Women Run to me, I knew I had to read it. I love running, and I love reading... so why wouldn't I love reading about running? Well, I did love it! In Mile Markers, Runner’s World contributing editor Kristin Armstrong captures the ineffable and timeless beauty of running, the importance of nurturing relationships with those we love, and the significance of reflecting on our experiences. This collection considers the most important reasons women run, celebrating the inspiring passion runners have for their sport and illustrating how running fosters a vitally powerful community. With unique wit, refreshing candor, and disarming vulnerability, Armstrong shares her conviction that running is the perfect parallel for marking the milestones of life. From describing running a hardfought race with her tightly-knit group of sweat sisters, to watching her children participate in the sport for the very first time, Armstrong infuses her experiences with a perspective of hope that every moment is a chance to become a stronger, wiser, more peaceful woman. Running threads these touching stories together, and through each of them we are shown the universal undercurrents of inspiration, growth, grace, family, empowerment, and endurance. Overall, I absolutely loved reading Mile Markers. The author is Kristin Armstrong, who just happens to be Lance Armstrong's ex-wife, so that is also pretty cool. This book was easy to read in chunks because it is split up into a series of blog posts that Armstrong has written. If you're a woman and a runner, I highly recommend this book. If you're not but you'd like to be (a runner), check it out - it will give you the inspiration you need to get started! This book makes me want to find a running group so I can become great friends with them like the women I read about. Do you like reading books about sports? What is your favorite memoir type book? I want to check this book out now. I just recently started running and I would really love to do a half marathon next year.